Campbell goblets are on their way home! One of twelve Campbell goblets that are coming home. First day back in the office after a long weekend, and we have an email from a board member announcing he’s secured the donation of some Campbell possessions from the Selkirk auction back in February 1941. What was the Selkirk auction? 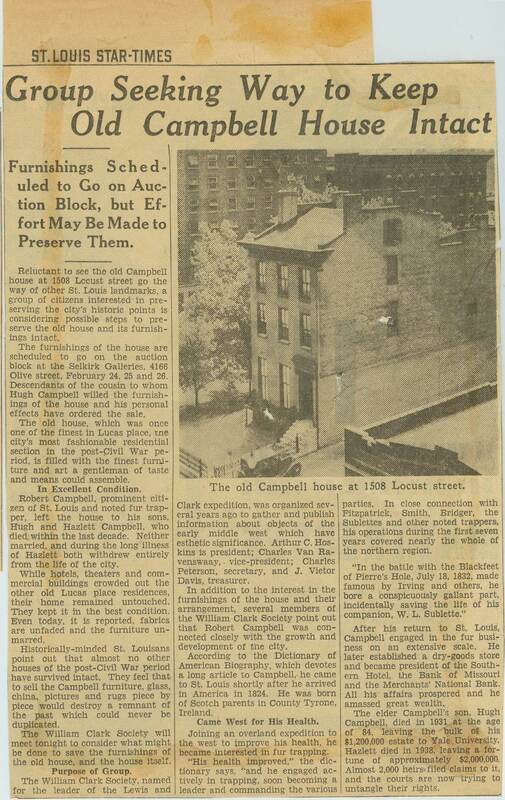 After Hazlett — the last surviving Campbell — died in 1938, the Campbell estate went through a long probate case. It was one of the largest in Missouri history, and it took ten years to wrap up. 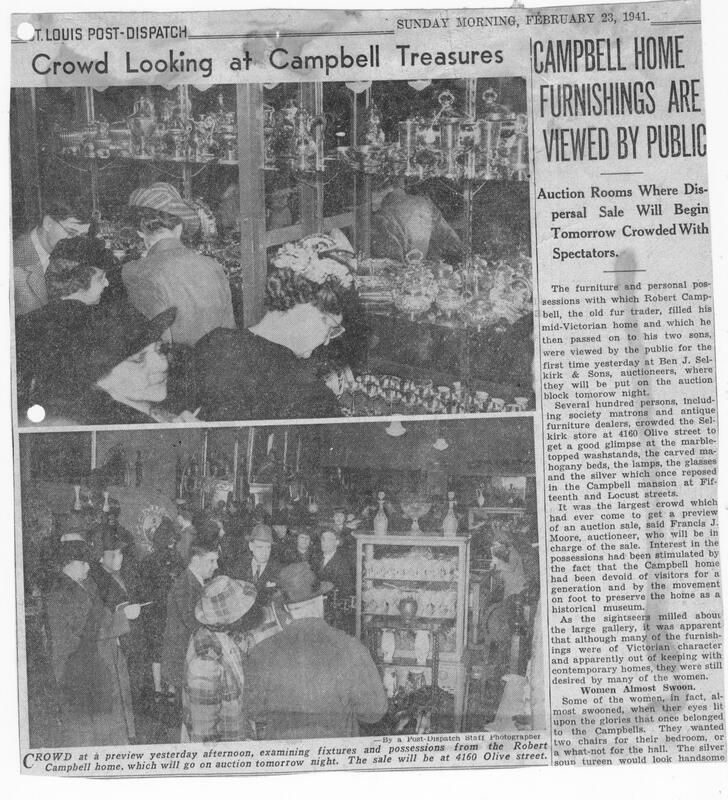 As part of the settlement — and why we have many of the possessions we do — all the Campbell furnishings went up for auction at a 1941 sale by Ben J. Selkirk and Sons (now Ivey-Selkirk Auctioneers). Stix, Baer & Fuller, meanwhile, purchased the house from Yale University (who had inherited it), and they in turn donated it back to the newly formed Campbell House Foundation. Since the Campbells’ furnishings were auctioned at a public sale and the foundation only had a budget of $6,500 to buy back as much as possible, quite a few items ended up with other families. Fortunately, many generous folks have given us back items over the years. Today was no exception. Hemispherical body with double-scroll border, baluster and ring stem; rising circular foot with beading, height 4-1/4 inches. They fetched a whopping $2.25 each at the 1941 Selkirk auction. St. Louis Post-Dispatch clipping of the Selkirk auction. These cups are on the bottom shelf of the case in the top picture. Also note that "Women Almost Swoon." To the left is an image of a page from the Sunday, February 23, 1941 edition of the St. Louis Post-Dispatch, and these cups can be seen in the top picture on the bottom shelf of the case. 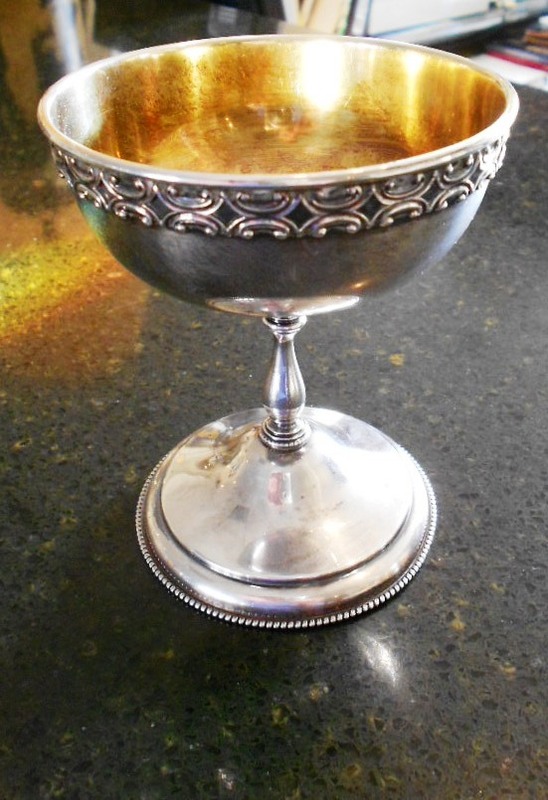 Want to see the goblets (and all of our other cool stuff)? They’re not here just yet, but give us a call at 314/421-0325. The house is open by appointment only in January and February, but we are here all week and we’re always happy to welcome guests. With this donation, ongoing mysteries and all the other exciting programs and events we have on tap, 2012 has kicked off swimmingly. From the Campbell family to yours, we hope that you’re having a happy and productive new year.